As the title said, I imported a simple biped rig from the new Source 2 SFM, but its rotation does not match the rotation of the iPi character. I do not see any tools that would help me rotate the imported rig into a correct position, so I do hope there is another solution for my problem. Thanks in advance! 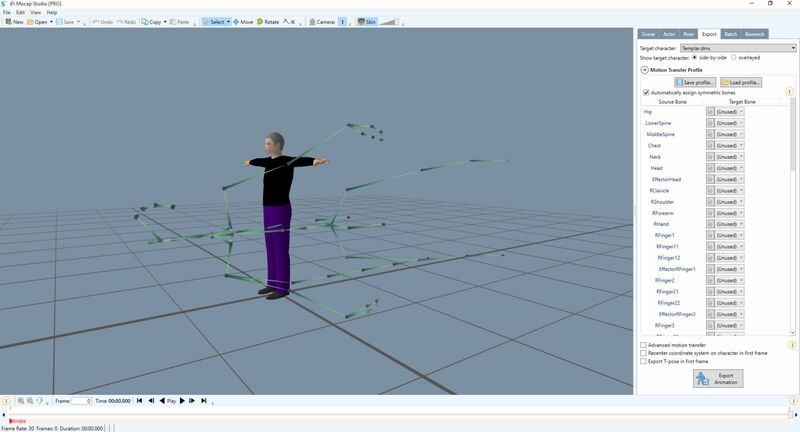 Currently, Mocap Studio can only retarget on characters designed with vertical Y axis (spine goes along Y), which is pretty common for bipeds. As I can see on the screenshot, in your character spine goes along the X axis. To use it with Mocap Studio, you should correct its axes in external editor. Thanks for the answer! Can you name me a few external editors that could fix this problem? Would 3DS Max do the job with the problem I have? You can try to do it via Blender. Install Blender Source Tools. Import your model with Z axis up and then export with Y axis up. As Blender Source Tools export DMX in binary format only, and iPi Mocap Studio currently support only ASCII format, you'll need to convert exported file with dmxconvert before importing to Mocap Studio. Got the Blender and the Plug In and managed to export the new .dmx with the correct rotation. However, I am not sure how to get the dmxconverter working? Is it a file that I have to download, and if so, do you mind linking the download page as I was not able to find it myself? Still struggling to launch Reborn Tools with SFM 2 to check characters from there. In spite of reporting Reborn Beta DLC as installed there are no items for playing Reborn or launching Reborn Tools in launch dialog. Thanks for the help guys, but I have managed to find a solution over other ways. If anyone ends up having a problem similar to mine, use the SFM 1.0 skeleton and import it into iPi Soft. This skeleton can be used on SFM 2.0 models, even though I expected rotation problems. However, it's almost impossible to get SFM 1.0 Dota 2 skeletons, so shoot me a message if you need them.